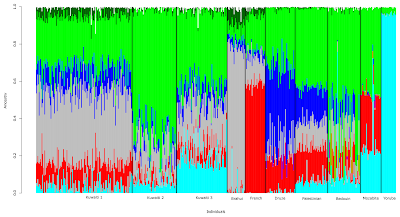 The variety in African admixture in the 3rd group suggests recent admixture.. Probably from Swahili slaves during the Zanj revolt. Their African admixture is unlikely caused by prehistoric events. The 2nd group of Kuwaitis seem to be mostly pure Arabians. The distinct structures in such a small country is rather remarkable. I must say I dont know a lot obout Kuwaiti history. But usually the major cities contain the most recent arrivals, with the original population are concentrated in remote villages and traditional folk (including nomads). Nomads of course travel so they tend to be a bit more diverse. Kuwait is coastal, and lies on Africas very threshold, hard to imagine it would be devoid of African. I would expect immigrants from deeper into arabia to contain less African. The Yemenite Jews, who historically lived much much closer to Africa and are essentially local pre-Islamic Arabian converts, seem to have almost half the amount of African ancestry as that 3rd group of Kuwaitis. Yemenites Jews can be used as a benchmark of the genetic profile of pre-Islamic Arabians. So, the elevated African ancestry in certain Kuwaits is almost certainly caused by the recent Swahili slave trade and not from prehistoric dispersals of Africans into the Middle East. Why should African haplogroups and in particular MtDNA L clades always come from the slaves? L has been found in Iberia and Near East in ancient specimens, so these Afro-Eurasian contacts are not a recent development, and I am not so sure that it was slaves who had so many offspring to leave a strong genetic mark. If so, they were surely very beautiful and intelligent women. If you do a detailed genetic analysis on Gulf Arabians you will find out that a big portion, if not most of their African ancestry does not come from the nearest African region (the Horn of Africa/Ethiopia) but from way further inland as in Central Africa/Bantu related admixture. This can only be explained by the Swahili slave trade. Also, many haplogroup studies have already detected non-trivial levels of E1b1a-M2 in the Gulf Arab region, while this is completely absent in native Horn Africans/Ethiopians and relic Jewish populations of Arabia.. Again, clearly pointing to Swahili/Bantu slave trade related admixture. Though Arabs and Persians make up the majority, Kuwaitis are made up of more populations. You got in Kuwait allot of Balochi, Iraqis, Kurds, Palestinians, and some Indians too. Many haplogroups seem to have the highest frequencies in Ethiopia or Sudan. In my eyes, it seems that higher frequencies in Qatar and UAE of L3b and L1c, perhaps also L3e, may be a result of this slave trade, but I would not say the same for Qatar and UAE haplogroups L3d, L2a1, L1b and L0. I would say that L clades have come to Near East along different routes and at different times. It is worth noting that Kuwait has been a key node of Indian Ocean maritime routes since at least 3000 BCE. Yemen has been an important source of mariners in much of that time period on those maritime routes, but rarely been a destination for those trade routes in an of itself. So, using Yemen as a benchmark of ancient admixture isn't necessarily appropriate. Linkage disequalibrium studies of the autosomes of people who have those mtDNA haplogroups might be more useful in discriminating between various hypothetical sources of the current population genetic mix. Many L sub-clades have quite confusing origins. So, it is best not to assume based on a single letter sub-clades that it comes from region X or Y in Africa. Especially with clades like L3f and L2a, which are relatively frequent all over Africa. Deeper sub-clade analyses show their origins with far less ambiguity. Generally, if the L clade is common in Central Africa or the Swahili countries (Tanzania, Kenya, Mozambique etc. ), it obviously doesn't have a deep history in the Middle East. However, if it is more restricted to the Horn African countries or Sudan or Egypt it is more likely that it has been around in the Arabia/Near East for a long time. Examples of 'ancient' L clades in the Middle East: L0f2, L0a1d, L0a1c, L1b1a2, L5a1, L2a1d, most L4, L6, L3i, L3k, L3h, L3x types. Examples of recently introduced L clades to the Middle East: various L0's and L1's (except the above mentioned), certain L2's - especially L2a1a & L2a1b, of the L3's mainly L3e especially and some L3b/d's and of L3f L3f1b looks like a slave trade marker in the Middle East. The second half of haplogroups are typically completely absent in Christian Ethiopian groups and Jewish populations of Arabia. Hence, you can conclude from their prevalence in Muslim Arabs in the Middle East that it was facilitated by the slave trade along the Swahili coast.